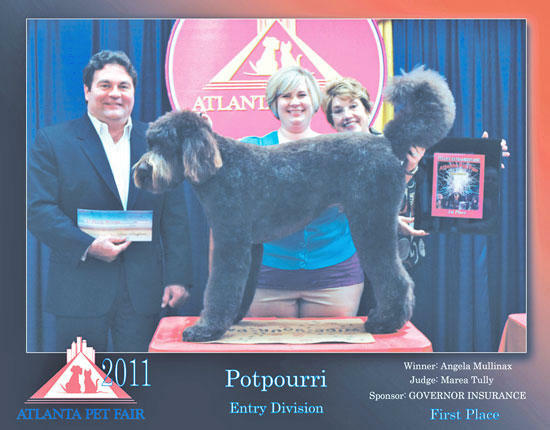 Angela Tate Mullinax of Woodbury recently attended the Atlanta Pet Fair in Atlanta, Ga. The Atlanta Pet Fair is the largest competitive grooming show in the southeast, with over 300 competitors this year. The competition is broken down into groups for different breeds of dogs. Angela competed in two different groups, the potpourri group and the toy/miniature poodle group. The potpourri group is the only group where a mixed breed is allowed. Angela placed first in this group with Chewie, a labradoodle owned by Mr. Brian Francis of Woodbury. She competed in the poodle group with Roscoe, a miniature poodle owned by Mr. and Mrs. Mike Broussard of Woodbury. The Atlanta Pet Fair also has a trade show and continuing education seminars. Attending the show with Angela were her husband, David, and her assistant, Katelyn Taylor. Angela would like to give a big “thank you” to Brian Francis and Mr. and Mrs. Broussard for allowing her to compete with their dogs. Angela’s dog grooming business is located at the Cannon County Animal Clinic, 124 Masey Dr., Woodbury. The phone number is 615-563-4022. That is awesome! Love the picture... Congratulations.